Although he made no mention of his opponents, Elk Grove mayoral candidate Kevin Spease's use of a prop likely is conveying one of the themes in his campaign to unseat Gary Davis in this Novembers race at a fundraising event held last night in Elk Grove. Last night's event was dubbed the "Let's Make a Splash." 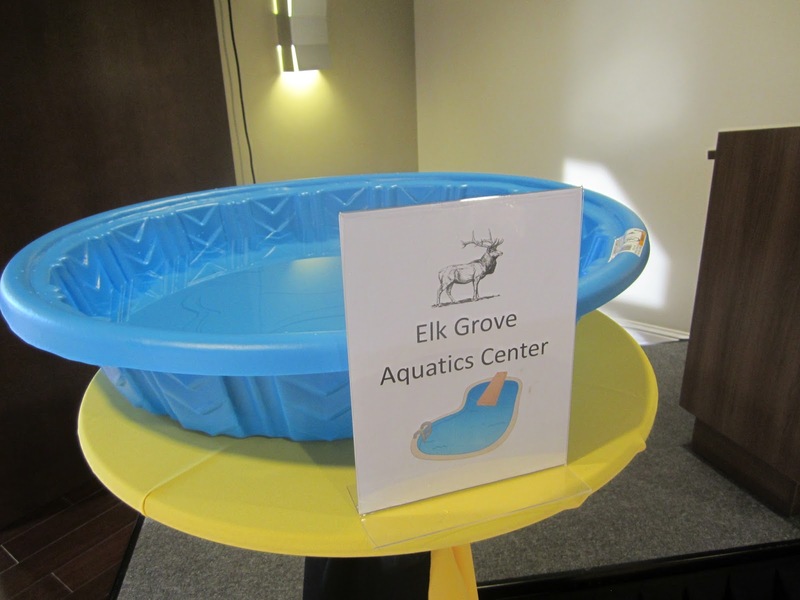 That prop, a small plastic child's wading pool with a placard that said "Elk Grove Aquatics Center," was prominently featured in his presentation to several dozen supporters who gathered at the Falls Events Center. Spease, an Elk Grove Planning Commissioner, is one of two declared candidates to date challenging the two-term mayor in the November general election. 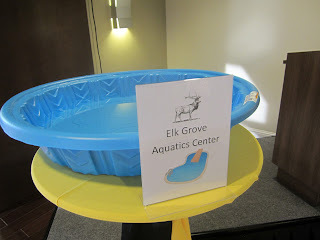 Although he never mentioned his name, the use of the wading pool was a statement of sorts of one of several beleaguered projects in Elk Grove spearheaded by Davis. Explaining the theme of the evening's event, Spease emphasized the theme is meant to illustrate "what we are doing and how far we have come so far." During his 10-plus minute presentation, Spease tossed golf balls into the wading pool to emphasize each of his major points. Spease related that an Elk Grove resident commended his participation in a recent Memorial Day event, and that same resident said he would appreciate city leaders that "are present in the community." "That's the next ripple we are going to make," Spease said as he tossed a golf ball in the pool. "Typically politicians don't show up unless there is a contribution or a news camera involved, and no one ever calls them on it, " he said. "Residents should expect that if someone wants to lead here in Elk Grove, that they should suit up, and show up." Among the supporters in attendance were former Elk Grove City Council Member Sophia Scherman, Elk Grove Planning Commissioner Frank Maita, and Sacramento County Office of Education Area 6 candidate, Stephanie Nguyen. Following his presentation, Spease invited Nguyen, who is involved in a tight race against Heather Davis, wife of Mayor Davis and two other candidates, to address the gathering. Following Spease's introductory remarks, Nguyen said after the two met they agreed to mutual endorsements and noted they shared similar values and hopes for Elk Grove. "My husband and I have been here for over 15 years, and we are ready for some changes," Nguyen said. "And the moment I spoke to Kevin...and I thought, this is the guy, Sign me up. Whatever you need."